The mining boomtown of Park City, Utah, nearly went bust when the mines closed, but it rose again, rebranding itself as an outdoor adventure town. Tucked high in the Wasatch Mountains at an elevation of 7,000 feet, Park City’s just 35 minutes from the Salt Lake City International Airport—making it ideal for a winter vacation—even if you don’t ski. From tubing to cross-country skiing to fat biking, the abundant winter adventures keep you entertained whether you visit for a week or a weekend. And that’s not all there is to do. Park City boasts a vibrant dining, bar, and art scene along walkable historic Main Street, and it offers a free transportation system so you can forego the rental car. Plan a winter escape here and see why Park City’s one of the country’s best and most accessible mountain towns. Explore Park City without a lift ticket by clicking into on a pair of cross-country skis and venturing out on the local trails. Cross-country skiing is simple to learn—and a killer workout to boot. Start by renting gear and taking a lesson at White Pine Nordic Center adjacent to Hotel Park City. You’ll glide along 20K of winding, groomed trails beside the mountains that pass Park City’s iconic white barn. Choose from gliding in the classic track or the speed of skate skiing, and take a tour of the area with local guides if you have time. Venturing out on your own? Find 25 kilometers of free-to-use trails at Basin Recreation surrounding the popular Utah Olympic Park, or take on the rolling terrain in Round Valley. Go for a peaceful walk in the woods on snowshoes along Park City’s trails. Choose flat, in-town options or challenging mountain climbs—depending on how much of a sweat you want to work up. Go with a guide to find the hidden trails and safely explore in darkness on a starlight tour. Low-impact and fun for all ages, ice skating is a family activity that’s a serious cardio workout. Skate the town’s only outdoor rink at Park City Mountain with festive music. No time limits or skate sessions mean you can stay as long as you like. When the weather’s dicey, skate away an afternoon at the indoor Olympic-sized skating rink at Park City Ice Arena. It’s open year-round and welcoming to all ages and abilities, but subject to event closures and rink rentals. 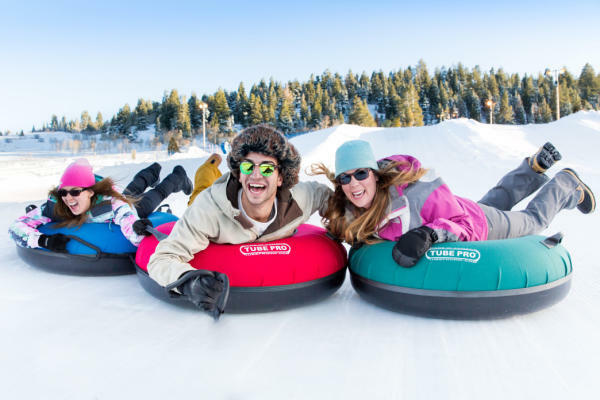 You’ll have a blast sliding on snow at Gorgoza Park. Sit on your tube and be towed to seven tubing lanes with varying difficulty levels, riding again and again without a tiring walk to the top. You’ll also find mini-snowmobiles for young kids to ride. For an after-dark adventure, try twilight tubing under the lights. The Rocky Mountain Sleigh Company will let you discover what over the river and through the woods really means. The horse-drawn sleigh rides on its ranch bordering the Weber River take you far from the crowds and you can enjoy a true winter escape. After the sleigh ride, you can enjoy dinner in a charming log cabin with a large wood-burning fireplace. Another option is to bundle up under a blanket and take a horse-drawn sleigh ride through the snow at Park City Mountain Resort with Snowed Inn Sleigh Co. Make a night of it and ride with a real cowboy as your sleigh driver to the rustic Snowed Inn where a multi-course, Western-style dinner paired with live music awaits. 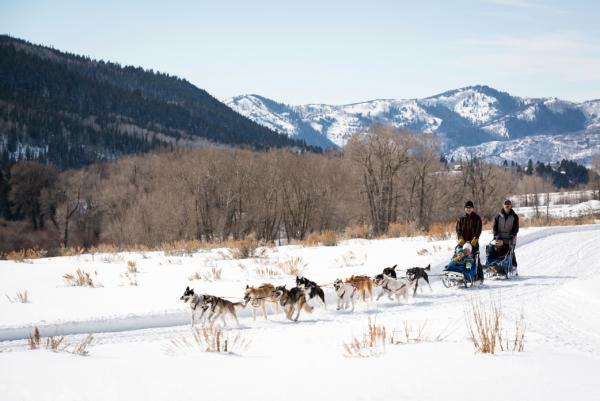 Feel transported to Alaska’s Iditarod race with a dog sled tour through the snowy meadows of the Wasatch Mountains on private trails. Mushers and their teams of huskies take adults and families with kids as young as three on hour-long tours--and you’ll even have a chance to learn how to mush, too. Park City is known for mountain biking, but the fun doesn’t have to stop once snow blankets the ground. Thanks to fat tire bikes, which have burly tires made for rolling over packed snowy terrain, you can ride popular mountain biking loops like Glenwild and Round Valley throughout the winter season. Rent a bike and take a lesson from outfitters in town who teach you the in’s and out’s of navigating on snow. Skiing’s not the only way to explore Park City’s backcountry. 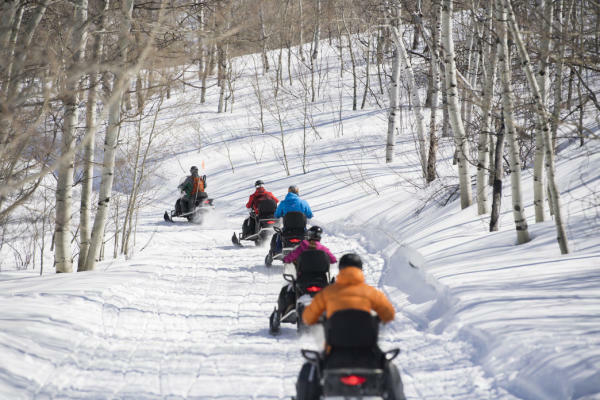 Rent a snowmobile or sign up for a guided tour and take on an exhilarating exploration of the Wasatch and Uinta Mountains’ aspen and pine forests. For the closest-to-town tours, snowmobile with Red Pine Adventures through 1,000 acres of privately owned mountain terrain varying from easy groomed trails to advanced untouched powder bowls. Take on the highest, deepest trails at Adventures at Thousand Peaks through 60,000 acres of wilderness terrain—with a lunch stop at a backcountry cabin in the woods. Whether you’re skiing, biking, or snowshoeing your way around Park City, you deserve a break after a long day. Thankfully, the town boasts plenty of restaurants and bars where you can relax after a day outside. Head to High West Saloon, the world’s first and only ski-in distillery, for a hot toddy or spiked hot chocolate made with distilled-in-Utah spirits. Or visit Old Town Cellars on Main Street for a glass of Mountain Town Red. Take the party into the night at The Cabin, where music plays late and drinks like Honey Hole Cider and Town Lift Hot Chocolate help you thaw out. For a Western vibe, walk up Main Street to The Spur for cocktails made with local spirits and nightly live music. No matter what you do when you visit, for adventurous explorers, Park City is the place for winter vacationing.